F-4 Phantoms from the recently inactivated 20th Fighter Squadron taxi into the Aerospace Maintenance and Regeneration Center, after making their last flight from Holloman AFB, N.M., to Davis-Monthan AFB in Tucson. At exactly 10:15 a.m. MST, on Jan. 7, 2005, a pair of F-4F Phantom II fighters touched down at Davis-Monthan Air Force Base in Tucson. Not only was it the last flight for both aircraft, which were from the last operational F-4 squadron—the 20th Fighter Squadron, known as the “Silver Lobos”—but it was also the end of a very successful program to train German F-4 flight crews. The squadron was inactivated on Dec. 20, 2004. 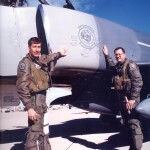 During the period Nov. 18, 2004 through Jan. 7, 2005, the entire fleet of 15 F-4s were flown to the AMARC facility in Tucson, where they were retired. 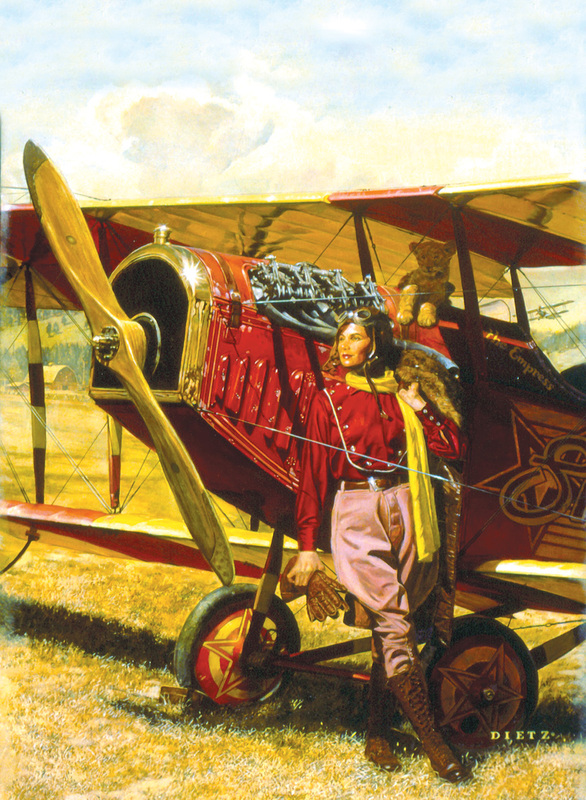 The United States has had a long and rich tradition of allowing pilots from allied nations to train on American soil. This bond has been particularly strong between the U.S. and Germany. The first German Air Force class started in August 1957, at Luke Air Force Base in Arizona, on the American-built F-84. 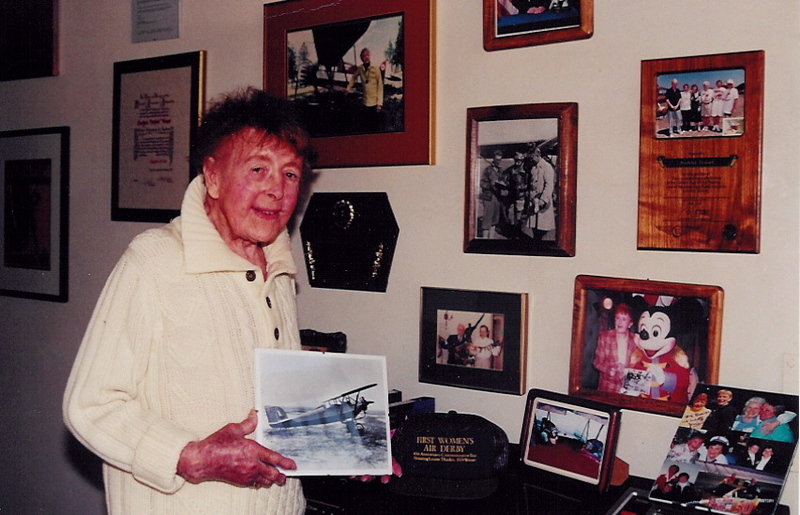 Enrolled in the training program was World War II German ace Major Erich Hartmann. With 352 kills, Hartmann was the world’s leading ace. Lt. Colonel Gunther Rall was also in the same class; he had 275 kills. Both pilots achieved their records on the Eastern Front. The F-84 program graduated 6,930 students when it ended in 1964. Then, in April 1964, the U.S./German F-104 Starfighter program was launched at Luke AFB. When it ended in 1983, it had produced 2,200 graduates for NATO Air Forces. In 1972, a program to train German flight crews on the F-4 Phantom was established at George Air Force Base in Victorville, Calif. 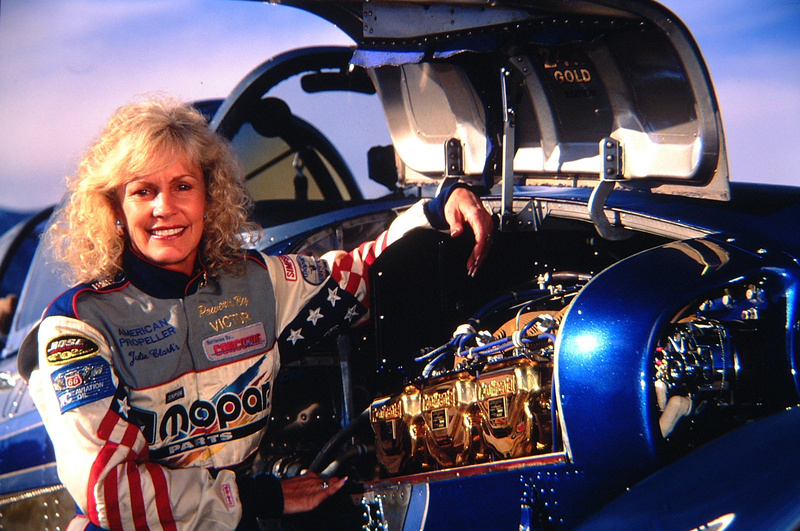 Included was initial qualification training for new pilots and weapon systems officers. 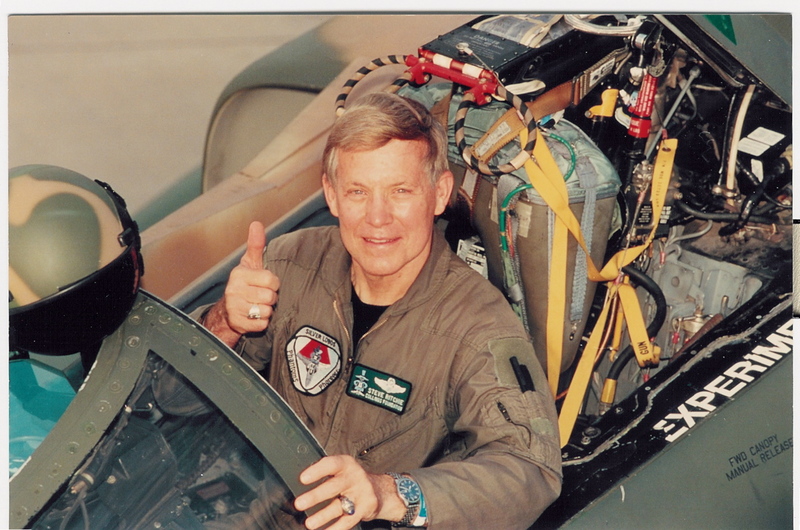 A fighter weapons instructor course was later added for experienced F-4 flight crews. 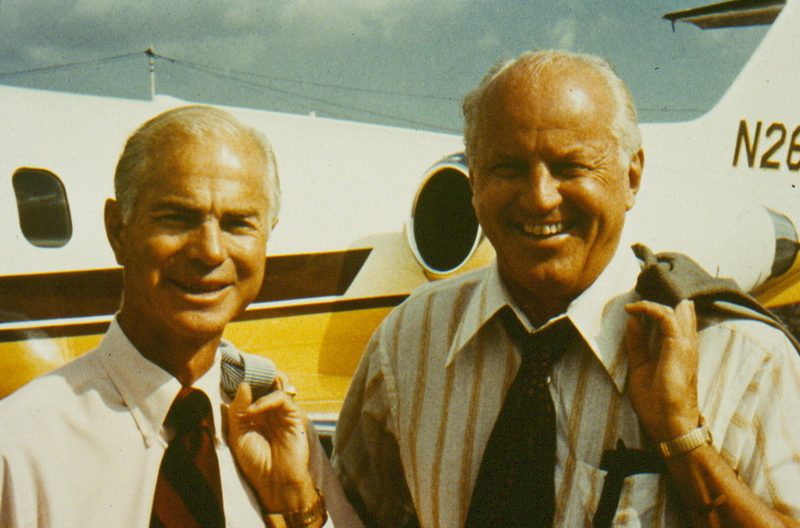 German Captain Martin Brendjes and his WISO Stan Reinders congratulate each other with a thumbs-up handshake following the completion of their final mission. 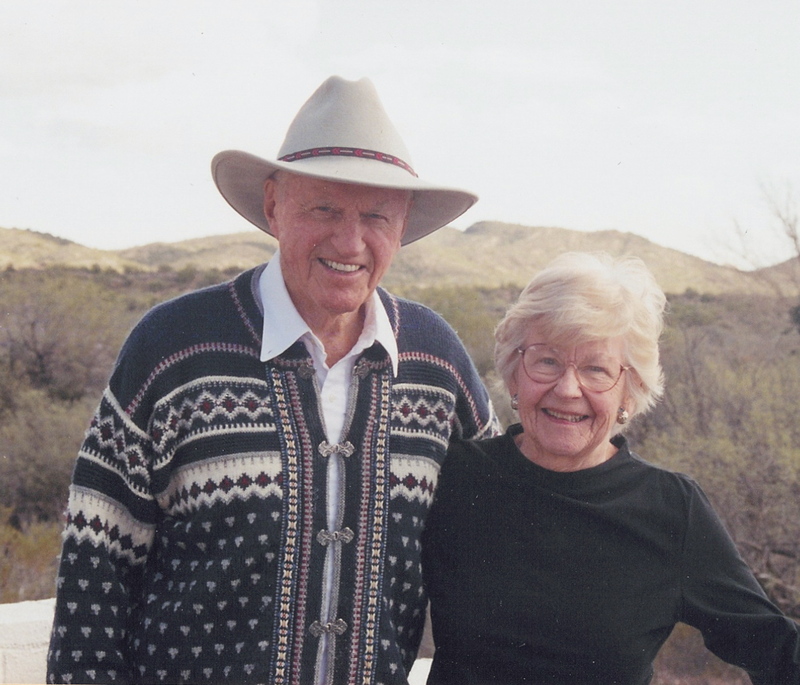 In 1990, President George Bush Sr. extended an invitation to the Germans to establish a German Air Force training installation in the U.S., at Holloman AFB in New Mexico. 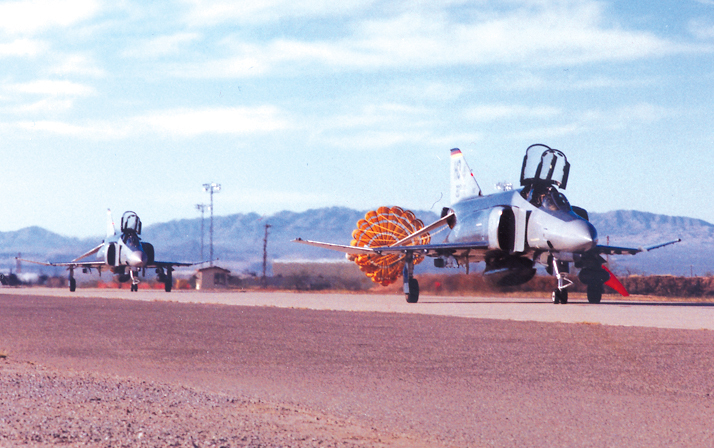 The F-4 training program was relocated from George to Holloman in 1992, where the Germans built what is today the German Air Force Flying Training Center. 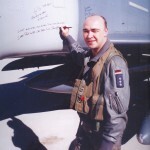 Its Commander, Colonel Wolfgang Fahl, was a graduate of the F-104 weapon systems training program at Luke and the F-4 instructor training at George. In 1999, the GAF/FTC had 15 F-4F Phantom aircraft and 35 Tornado aircraft, supported by 685 personnel. It was the largest German Air Force installation on foreign soil. The excellent flying weather in the southwest afforded the Germans the opportunity to conduct 12,500 flying hours per year. The McDonnell F-4 Phantom made its first flight in 1958. 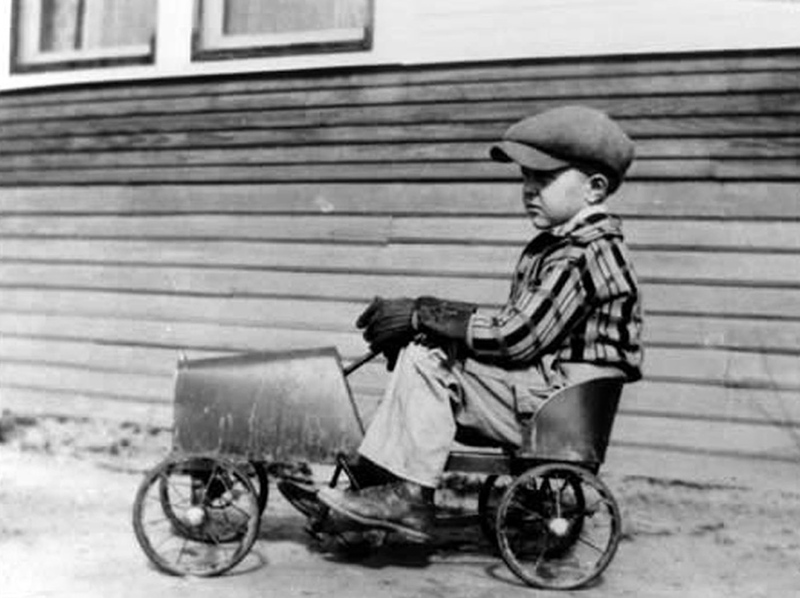 It was a veritable workhorse in the Vietnam conflict and a veteran of Desert Storm. As one witnesses the last two Phantoms taxi across the AMARC receiving line into retirement, you can’t help but appreciate the dominating visual presence that the aircraft presents. 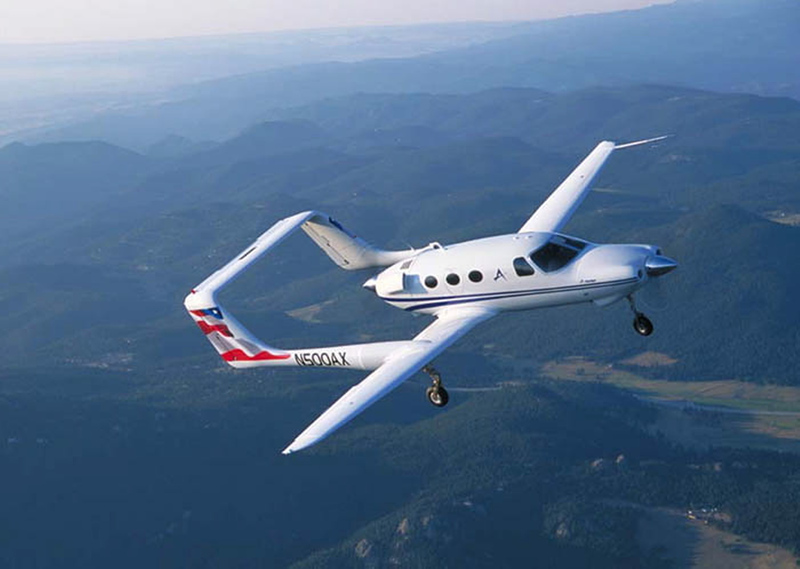 It is a powerful looking machine akin to the muscle cars of the 1960s. 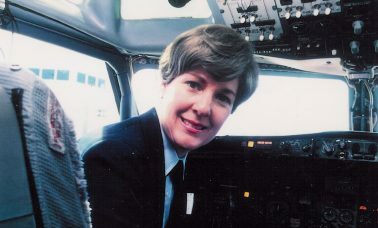 The squadron commander, Lt. Col. Mark Buccigrossi, piloted the lead aircraft, ship #163; his backseater was Lt. Col. Kevin Zeeck, the squadron’s duty officer (both were USAF). 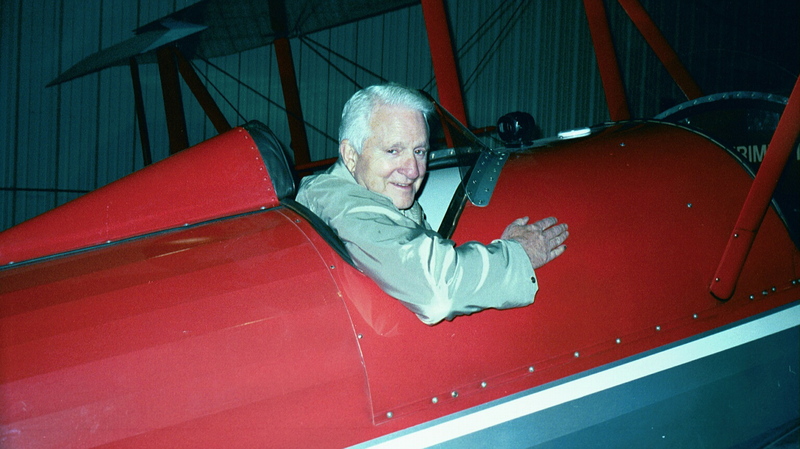 Captain Martin Brendjes piloted the second aircraft, ship #180; his WISO was Major Stan Reinders (both Luftwaffe). 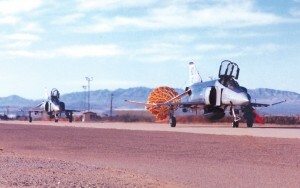 Pulling their drag chutes behind them, the aircraft parked in a line of Holloman F-4s, next to the one that had arrived the day before. On hand to meet the aircraft were two civilian life support technicians from Holloman, George Anderson and Dale Ellington. Each flight crew produced the traditional bottle of champagne; the contents were used to christen the aircraft and make the ceremonial toasts, closing another chapter in the life of a great American fighter. 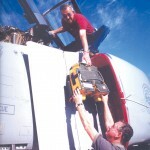 Civilian technicians George Anderson (bottom) and Dale Ellington (top), from Life Support at Holloman AFB, remove each crewmember’s survival pack from the F-4, immediately following the aircraft’s arrival in AMARC. 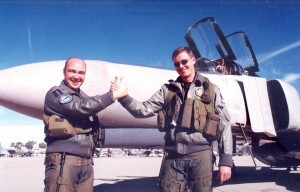 Duty Officer Lt. Col. Kevin Zeeck and Lt. Col. Mark Buccigrossi, the commander of the 20th Fighter Squadron, next to their F-4 Phantom. 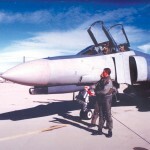 Crewmembers spray the nose of the F-4 with a bottle of champagne, symbolizing its last flight.